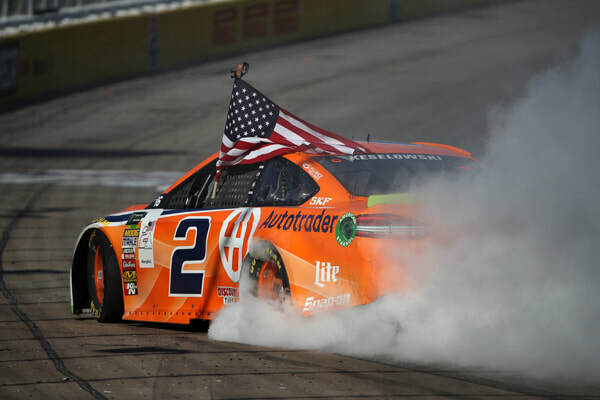 Lady Luck was riding shotgun with Brad Keselowski during the South Point 400 on Sunday, Sept. 16, 2018 when he collected his third consecutive victory of the 2018 season, putting smiles on the faces of veterans. Always wanting to give back to America’s heroes, Keselowski teamed up with North Carolina-based orthodontists Drs. Matt and Megan Lineberger in 2017, taking part in their Stats for Smiles program. Initially created to provide orthodontic treatment to underprivileged children who lacked access to care, Stats for Smiles now provides orthodontic care to military veterans in addition to kids in need. The athlete-based, stats-driven giveback program provides the donated service when predetermined accomplishments are achieved on the court, the field or the racetrack. Keselowski’s participation in the program is simple: win a Monster Energy NASCAR Cup Series race and one military veteran in need will receive free orthodontic care from Lineberger Orthodontics. Military veterans are selected to receive this complimentary treatment with the assistance of Hope for the Warriors. Multiple military veterans have received treatment courtesy of Keselowski’s victories since the partnership began last year, and now one more veteran will receive needed orthodontic treatment from Lineberger Orthodontics thanks to Keselowski's Las Vegas Motor Speedway victory.